To learn more about the Madera IRWM group, please visit the Madera IRWM website here. The County is located in the geographic center of California in the Central San Joaquin Valley. It covers approximately 2,147 square miles (1.4 million acres). It has been divided into two main study regions, in recognition of hydrogeologic differences. The relatively flat-lying western third of the County, which overlies alluvial groundwater basins, is referred to as the Valley Floor, and the remaining eastern two-thirds, which consists of the foothills and mountains of the Sierra Nevada, is referred to as the Foothills and Mountains. The IRWM Plan includes focused hydrogeologic studies of four areas in the Foothills and Mountains, including Oakhurst, Coarsegold, North Fork, and Raymond-Hensley Lake. The County is one of the fastest growing areas in California, with growth averaging 3 percent per year from 2000 to 2007. Its current population of approximately 148,700 is anticipated to almost double to approximately 273,000 by 2030 based on projections by the California Department of Finance. 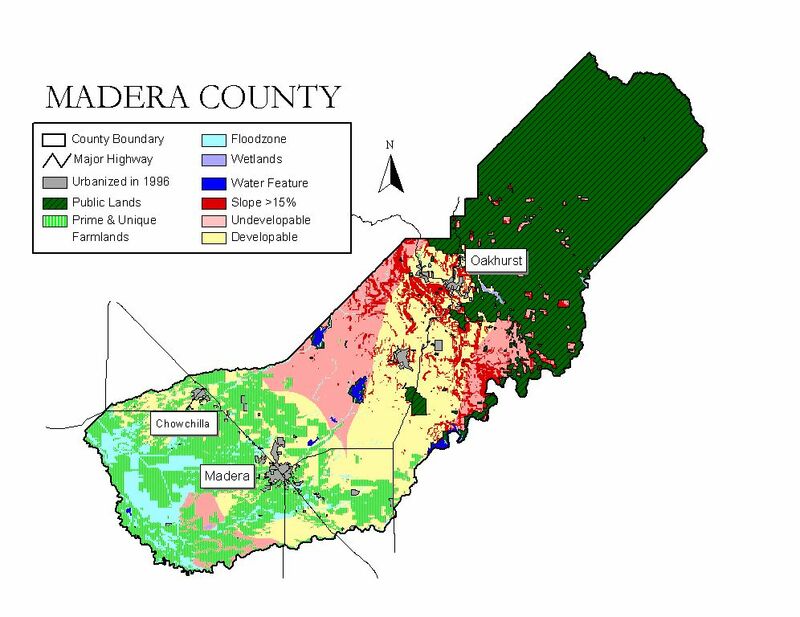 According to Madera County Planning Department estimates based on area-specific plans, the population of the County is more likely to be approximately 355,000 by 2030. The main land uses in the County include agricultural, open space, residential, commercial/ institutional, industrial, and irrigated landscape. Agriculture comprises 53 percent of the land use with open space at 38 percent. The remaining land uses comprise approximately 9 percent of the total land area. Runoff from rainfall and snowmelt feeds the rivers, lakes, and reservoirs in the County. The San Joaquin River forms most of the southern and western boundaries of Madera County and ultimately serves as the discharge point for runoff from about 90 percent of the County (including the Fresno River and Chowchilla River basins). 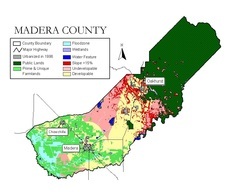 Less than 10 percent of precipitation and stream flow originating in Madera County drains out of the County to another river system (i.e., westward into the Merced River system). The existing water resource systems in the County include irrigation water, drinking water, wastewater, and stormwater systems. These systems are owned and operated by irrigation and water districts, urban and rural water purveyors, and the County government. There are no irrigation or water districts in the Foothills and Mountains.